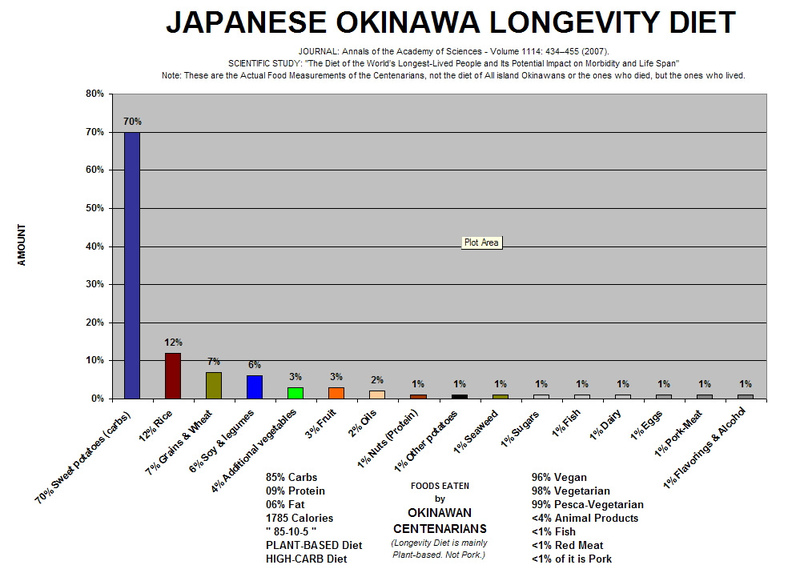 The Okinawa Longevity diet is plant-based: 98 percent vegetarian and 96 percent vegan. A whopping 85% carbs. Okinawans eat huge amounts of Starch, and Grain. Okinwans eat sugar. Okinawans eat lots of Soy. Okinawans eat lots of potatoes, and rice. The Okinawans eat beans and legumes. The okinawans eat wheat. And are among the longest living people on earth. Notes: Okinawans Do Not eat tons of pork. Okinawans Do Not eat tons of fish. The okinawans avoid meat. 99% of the Okinawan diet is NOT PORK. 99% of the Japanese Okinawan diet is NOT FISH. It is Not true that the Japanese Okinawans eat a lot of fish. It is NOT TRUE that Okinawa is “The Island of Pork”. It is NOT true that the word Okinawa translates to The Island of Pork–this is an internet hoax that has been traced to an individual named Chris Masterjohn who was found to be part of a health-fraud group called the Weston A. Price Foundation. The actual word Okinawa (沖縄) consists of 2 Kanji characters in Japanese: Oki + Nawa ( 沖 + 縄 ). Oki means sea or water ( 沖 ). Nawa means rope ( 縄 ). Okinawa therefore actually means: “Rope of the Sea”–referring to the appearance of the ‘string of islands that reside in the sea’ at the southern part of Japan. These are known as the Ryukyu islands. There is nothing about the islands of pork. Okinawans do not refer to their own island as the island of pork. This is factually incorrect. It was simply concocted by a diet fraud group known as the WAPF, and then spread by those who got false health information from this group. They then spread this false line merely in lay-person “blogs” and simply as social network system or article comments on the internet, which is not scientific. 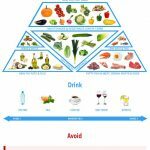 Much of it largely by people advancing a meat-based or low-carber diet plan, and who have never been to Okinawa or Japan or do not speak Japanese. It is fabricated. It is important to note, these are the actual Food Measurements of the Centenarians, the people who did live up over 100+ years. This is not the diet of ALL okinawan people. These are the ones who lived. Not the ones who died. There may be okinawans who eat differently. There may be ones that eat more fish, there may be onese that eat more eggs, less sugar, more dairy, or eat more meat or eat more pork. They did not live. They died sooner. The ones who lived ate what you see above. The Okinawans who lived to be centenarians up over 100+ years of age were eating a 98% Vegetarian plant-based diet. 96% vegan diet. Nearly 70% of which was potatoes, okinawan purple sweet potatoes which contain starches. Rice which is a starch. Grains and wheat, large amounts of Soy, and Tofu, Vegetables, and fruit, and ingested PUFA oils and even a quantity of refined carbohydrates in the form of sugar (composed of both glucose and fructose), and are among the healthiest longest-lived people on earth and are one of the Blue-Zones of longevity. This may be classified actually as an ANTI-PALEO DIET, due to the fact that it consists of grains, including wheat, encourages beans and legumes, is mainly vegetarian, encourages rice, contains hardly any fish, and hardly any bacon or pork, and avoids meat. It is almost the opposite of a paleo diet. This mainly vegetarian plant-based diet results in some of the longest lifespans on the planet. Regular okinawans may eat differently, and may eat slightly more pork, but die quicker. Those Okinawans who avoided meat, avoided fish, avoided dairy, and avoided eating pork such that all of these items were less than barely 1% of their diet, lived the longest. The Okinawan centenarian diet is 85% carbs, 09% protein, and 06% fat. 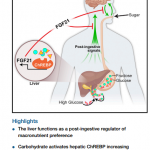 This is a High-Carb, Low-Fat, Low-Protein diet: HC-LF-LP. HCLF. This is NOT a lowcarb diet. This is Not a high-protein diet. Those people who ingested a lowcarb or high protein diet died sooner and had more disease. The diet that matches most closely to this longest-lifespan diet, is an 80-10-10 plant-based diet. The Okinawan diet is 98% vegetarian, which includes the eggs and dairy. The Okinawan diet is 96% vegan, which excludes the eggs and dairy. The Okinawan diet is barely 1% fish, and is 99% other than fish. The Okinawan diet is barely 1% pork, and is 99% NOT PORK. The Okinawans who lived the longest ate more plants and avoided fish, eggs, meat and pork.